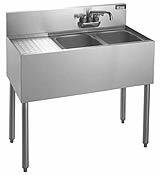 Krowne Stainless Steel Bar Sink 1832 - 18" Front to back depth. 3' long. One 12 inch drainboard on right or left. Two 10" x 14" x 10" sink bowls. 1/2" corner sink drains. Faucets and Drains with an overflow are included. NSF approved, of course.